Rain jacket by FUCHS & SCHMITT. Functional microfibre with rainwear laminate. Windproof, waterproof, breathable, and moisture-regulating. 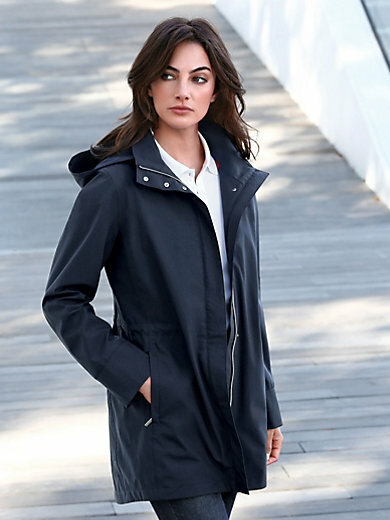 Thoughtful features include variable, high-closing collar, detachable hood with press studs and drawstring waist with internal stoppers for width regulation. 2 secure seam pockets with zip. 1 inner zipped pocket. Outer material and shoulder padding 100% polyester. Lining 100% nylon. Length approx. 34ins. The rain jacket is machine washable;e.